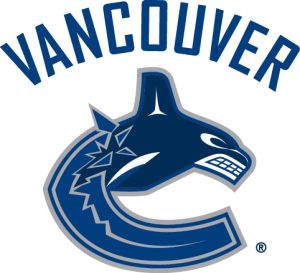 The Canucks Autism Network Membership Benefits Program invites CAN members to take advantage of a variety of perks including special offers, discounted admission, and enhanced accessibility at a variety of facilities and businesses across the province. 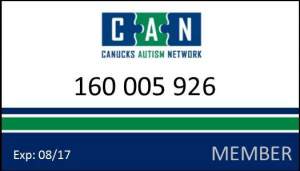 The new Canucks Autism Network (CAN) Membership Benefits Program allows members to take advantage of a variety of exclusive benefits including special offers, discounted admission, and enhanced accessibility at partnered facilities across the province. CAN members can access their digital membership card through the My Account page of their online account. Membership cards can be downloaded and saved to a mobile device or printed and presented as a hard copy. The name of the participant(s) with autism will appear on the card, however, it can be used by the individual and their immediate family members. The pilot phase of the CAN Membership Benefits Program launched in April of 2017, with the introduction of select CAN Membership Benefits Partners. With time, the goal is to introduce CAN member benefits in communities across the province. While CAN Membership Benefits Partners have an attitude of acceptance and a willingness to learn, we ask that CAN members recognize that staff at participating businesses and locations will not have extensive autism training and may not be able to identify that a customer is on the autism spectrum. Autism Aware is an initiative that aims to educate and empower businesses and establishments to be more inclusive and accepting with the goal of providing families living with autism with opportunities for meaningful inclusion in all community activities. Autism Aware partners have participated in autism training workshops and have made various business adaptations to better support customers on the autism spectrum and their families. *With the purchase of admission for one patron with autism. 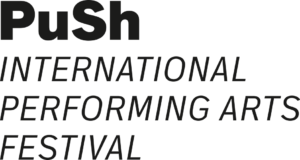 View details on the PuSh Festival’s relaxed performances for individual with autism and their CAN Membership Benefits offer on their Accessibility webpage. Thank you for your interest in the CAN Membership Benefits Partner Program! We are always looking for new partners who share our values. At Canucks Autism Network, we take a neutral stance when it comes to autism research and therapies, therefore, we are not able to accept any partners who align with any therapy or research-related products or services. To submit your interest in becoming a CAN Membership Benefits Program Partner, please complete this short application form. Benefits provided are at the discretion of CAN Membership Benefits Partner and may change at any time without notice. If you have any feedback about a participating partner, or a positive experience that you would like to share, please complete this short feedback form and we will be sure to pass along your comments to the CAN Membership Benefits Partner. Who qualifies for a CAN Membership Benefits Card? The CAN Membership Benefits Card is available to active CAN members. A CAN membership is deemed active if the membership fee payment is up to date. Who can use the CAN Membership Benefits Card? The CAN Membership Benefits Card can only be used by the individual with autism and their immediate family members (parents/guardians, siblings), as listed in the CAN membership participant profile. How long is the CAN Membership Benefits Card valid? The CAN Membership Benefits Card is valid as soon as an individual or family’s membership becomes active. CAN membership is deemed active if payment of the annual membership fee is up-to-date. How do I redeem a benefit offered through the CAN Membership Benefits Card program? Redemption instructions will vary with each participating benefits partner. 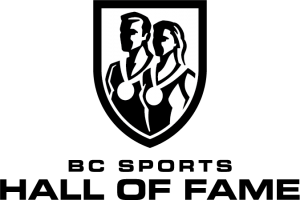 CAN members must be prepared to show their active CAN Membership Benefits Card at point-of-purchase or at entry of an event in order to take advantage of a benefit offered by a business or facility. Photo identification may also be requested for benefit redemption. Who do I contact to inquire about a perk offered through the CAN Membership Benefits program? You may contact our office during regular business hours (Monday-Friday, 8:30 a.m. – 4:30 p.m.) for information about the program. You can reach us by phone: 604-685-4039 ext. 201 or by email at [email protected]. How do I stay informed of the new benefits being added to the CAN Membership Benefits program? Check this page for an updated list of participating vendors. New benefits may also be announced on CAN’s social media channels and in the CAN monthly newsletter. I have a business or know of a business that may be interested in becoming a CAN Membership Benefits Partner. What are the next steps? Thank you for connecting us with a potential CAN Membership Benefits Partner. 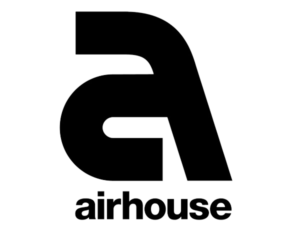 Please have them fill out our CAN Membership Benefits Partners application form and a member of our team will be in touch within 3 business days.